When a posterour tooth is affected by cavity, after completly discarding the damaged tissue in the dental office, various types of materials can be used to teplace the lack of substance. INLAY and ONLAY are the most frequent special restorations. They are used to reconstruct lateral teeth integrity which have medium or big cavity destruction. INLAY and ONLAY can also be used for cracked or fractured teeth if their destruction isn’t as severe as to need dental crown. 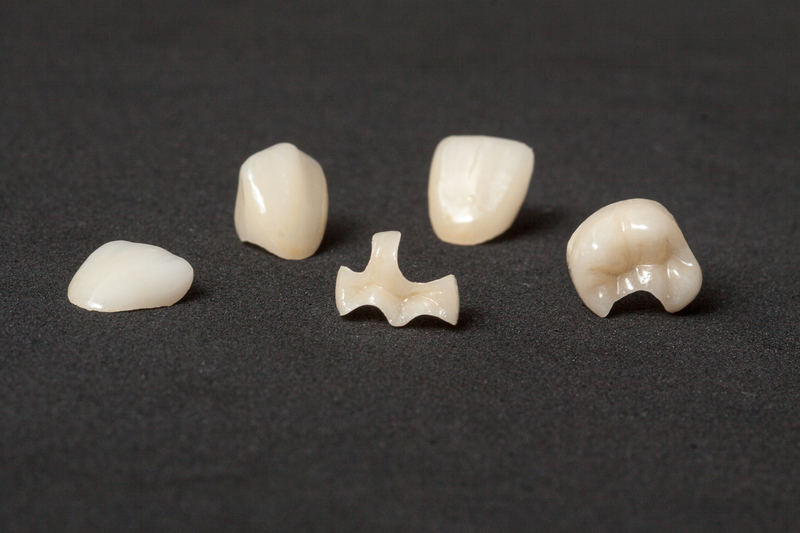 There prosthetic pices will be one with the tooth due to their manufacture and special rasinic cement. In this situation we can talk about tooth structure strenghtening and a protection barrier agains bacteria which could infiltrate and lead to cavities. In conclusion INLAY and ONLAY represent viable tooth cavity or coeonary fractions treatment, helping to preserve the natural tooth for a long time. In dental practice, dental INLAY represents restorative material application in order to replace the lack of dental tissue between a lateral tooth’s cusp. It can also be used to substitute old or deteriorated fillings. INLAY is usually done in two sessions. During the first CITY DENT session the tooth is impressed and cimented with a temporary INLAY or a bandage is placed on it. The tooth impression alongside the doctor’s stipulations regarding color, desired shape or particularities will be sent to the dental techniques laboratory. In the second session the temporary INLAY is removed and the permanent one is cemented using a special technique. Because it doesn’t need a repose period after it’s placement, the patient can go back to his daily activities after leaving the dental office. Due to the fact that is made of materials which imitate the tooth’s color (ceramic or composite resins) they can successfully replace old amalgam or composite obturations giving the patients a natural smile. We can say that this type of restorations are beneficial both from an esthetical and functional point of view. While dental INLAY is used to treat the inter cup lateral tooth cavities, ONLAY is used to restore a tooth which need structural renewal of the chewing surface of one or more cups. During the session at City Dent the tooth will be impressed and a temporary ONLAY will be cemented. The tooth’s impression alongside the doctor’s stipulations regarding color, desired shape or other particularities will be sent to the dental techniques laboratory to manufacture the ONLAY. During the second session the temporary ONALY is removed and the permanent one is cemented. As in the case of dental INLAY, the ONLAY can be manufactured using materials which imitate the tooth’s color (ceramic or composite resins). This way it is impossible to detect with the bare eye. Because it’s placing needs minimal tooth surface processing it helps preserve a great part of it. Maybe the most important benefit of dental ONLAY is that due to saving a great part of the tooth it helps patients avoid a more complex treatment. Each of us had the chance to notice someone’s classic filling because in time the amalgam will look like a piece of food stuck on the tooth. Both dental INLAY and ONLAY can be made of materials which imitate the tooth’s color (ceramic or composite resins) and in time thanks to the material’s properties won’t bleach. This way the tooth’s natural image is better preserved. Even more, in case of loosing the tooth’s enamel structure, it can be protected by applying ONLAY without needing tooth redesign. Both dental INLAY and ONLAY allow a flawless esthetic tooth restoration and perfect chewing surface. Because INLAY and ONLAY are computer-manufactured to perfectly fit the treated area, the tooth prepping will be minimal and easier to clean than in the case of a dental crown. Even more, while the classic amalgam can abridge during treatment, this can not happen with INLAY and ONLAY due to the fact they are prefabricated from porcelain. Because they imply two visits to our clinic, better results are achieved than in the case of a classic filling. Due to the fact INLAY and ONLAY they perfectly apply on the dental surface they allow a better cleaning while brushing and protection against tarter. When it comes to dental cavities treatment, numerous patients want quick results. Nobody wants to experience more than necessary tooth aches and cavities. Fore the most part, classic fillings are done during one appointment. Even though this approach can appear beneficial for the patient, it doesn’t necessarily represent the best treatment for the affected tooth. Classic filling are manually applied without much help than the magnifying lens which allow the dentist to better see the cavity he’s trying to treat. Unfortunately this approach leaves room for certain mistakes in composite design and applying which can lead to an imperfect chewing surface and even deterioration of the tooth’s health enamel. From this point of view, INLAY and ONLAY are designed using a conservative training which pursues keeping a great part of the damaged tooth. After our dentist has impressed the affected area it will send it to a partner laboratory where both INLAY and ONLAY will be computer manufactured to suit the shape and size of the treated tooth. At the next City Dent appointment, the final project will be fixed on the patient’s tooth using a special resin. The two procedures represent an optimal alternative in treating a dental problem which extends toward the minimal or moderate inter-dental area. They are an ideal option when whishing to avoid applying a complete dental crown. If you have a cavity between teeth you can use INLAY. It is a much better and longer lasting tooth seal against bacteria than a classic filling. In the case of cavity treatment both INALY and ONLAY are stable restoration materials which strengthen the treated tooth by keeping a great part of the healthy dental structure, thus helping the longevity of the tooth’s functionality.